Since visiting my home in Cornwall after two years of travel, I am back in travel mode in South America. 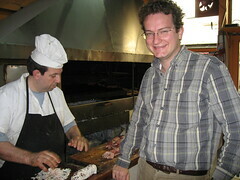 I’m in Buenos Aires, studying Spanish and taking in the steak. You can cut it with the back of a knife! This time Antoine isn’t with me, though Jamie is. police at each corner which makes me nervous. Though they have not troubled me yet. People kiss in public! GROSS! AND MEN KISS. WTF! Steak, chips with red wine and a tip is about 30 (ARS) pesos. That’s about 10 USD! Breakfast is small, lunch is at 2pm and dinner is at 9pm… argh! I’ll probably add to this.